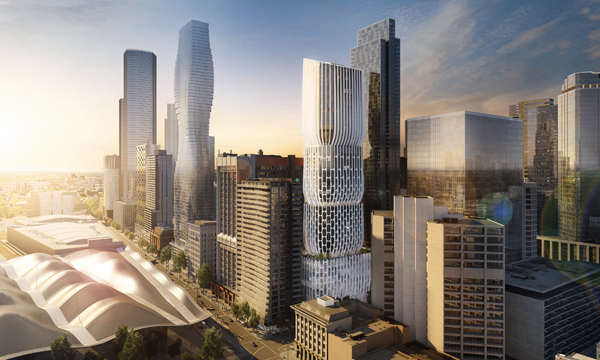 Melbourne’s CBD will soon be home to a new skyscraper from international architecture firm Zaha Hadid Architects. The $300 million mixed-use tower on Collins Street will include 420 apartments, office and retail space as well as communal public areas such as a ground floor art space, a public plaza and a publicly accessible terrace. Michele Pasca di Magliano is Associate Director at Zaha Hadid Architects based in the United Kingdom. Throughout the course of his career, Michele has led several competition winning schemes such as the d’Leedon residential complex in Singapore that received the World Gold Award for Residential High-Rise at the FIABCI World Prix D’Excellence Awards 2016. Currently, Magliano is leading a number of projects across East Asia and Oceania including 600 Collins Street for which he is project director. We caught up with him to discuss 600 Collins Street, working in Melbourne and the thinking behind that unique stacked vase massing. How did the concept for 600 Collins Street come about and what part did local context play if any? When I first visited Collins Street I noticed that there is a very interesting architectural context yet most contemporary buildings do not respond to it, conservation generally intends to leave the historic facade intact and build a modernist building around it. In 600 Collins we did not have any heritage element onsite yet we worked to create a building that departs from plain curtain wall and developed a new type of facade panelling which relates to some of the CBD's historic buildings. The building curves inward at the ground creating a new laneway and enlarging the Collins Street pavement which is needed especially in the west area of Collins Street which does not have as many pedestrian laneways as the Eastern CBD. We can't fix it all within one development but we hope to kick-start the process and encourage more projects to provide more open public space at ground level. The publicly accessible spaces continue at a high level with a public F&B deck above the podium which takes inspiration from successful examples in London and Hong Kong, a type of space which was missing on Collins Street. What benefit do the stacked volumes have for the building? We came up with the concept of stacking vases, where each vase acts as a container for different mixed-use element or combination of them. The most interesting conditions arise when the vases intersect, creating opportunities for outdoor access, sky lobbies and spaces which really enrich our client's brief and the building offering. People will be attracted to them as they can see from the street that something special is happening there. Thanks to our 3D design techniques also the floors immediately above those connections are affected with downward looking facades which will bring the outdoor spaces back into the building. What design elements, technologies or innovations of the project make it unique or set it apart from other high-rise structures? Mainly structure and facade: on the first we worked closely with our engineers to generate a structural system which followed the logic of the building geometry and its vases concept while working with construction technologies available in the Australian market. For the facade we developed a GRC panelling system and are currently studying its installation as in Melbourne CBD there are different height constraints height compared to the US or Hong Kong. What attributes or design elements of the 600 Collins St design reflect the Zaha Hadid philosophy? Every project has a unique brief, site and climate and we have our approach on how to tackle those. Our philosophy is to treat every project as an opportunity to evolve concepts and challenge the status quo. We are very interested in volumetric modulation in high-rises, creating facades and building envelopes that respond to both the local climate and the client brief allows us to create a very rich response to spatial problems. We conceive space as a social structure – people interact firstly within architectural space and a well-designed building allows better communication between its occupiers, as well as better privacy where needed for the residential component for instance. Facade layouts and vertical transportation also generate a well-designed space in line with our philosophy – more efficient, productive and enjoyable. Where do you think the future of ZHA lies within the high-rise space? What design elements will we see more of? How will ZHA evolve in the future? We are busy working at different scales. High-rises tend to be the response to dense urban clusters and the desire to be as close as possible to the centre. We work on bringing more communication and a sense of belonging to tall buildings, creating buildings where you can see what happens around you both horizontally and vertically. Our technological innovations are always driven by a new design concept, I really don't see the point of developing new technologies if buildings end up similar to their predecessors, but new designs and spatial solutions lead to innovation in an industry which is simply much slower to adopt new technologies compared with others, yet it creates long lasting legacies which affect everyone in our cities. We are very optimistic about the future and are working on developing new software tools which allow us to freely pick from different platforms and combine the best features of each. We are now using robotics and 3D printing at a new scale, helping these tools to make their way into the construction industry. Michele Pasca di Magliano will be speaking on ‘Exploring skyscrapers as catalysts for social interaction and discussing Zaha Hadid Architect’s spatial and urban approach to high-rise design at the Australian Smart Skyscrapers Summit later this month. The Summit convenes on the 28th and 29th of March at the Melbourne Exhibition and Convention Centre.